00:46 Blue Water Trade Winds Pvt. Ltd.
Fuel & Time savings are the primary objectives of any voyage optimization initiative. 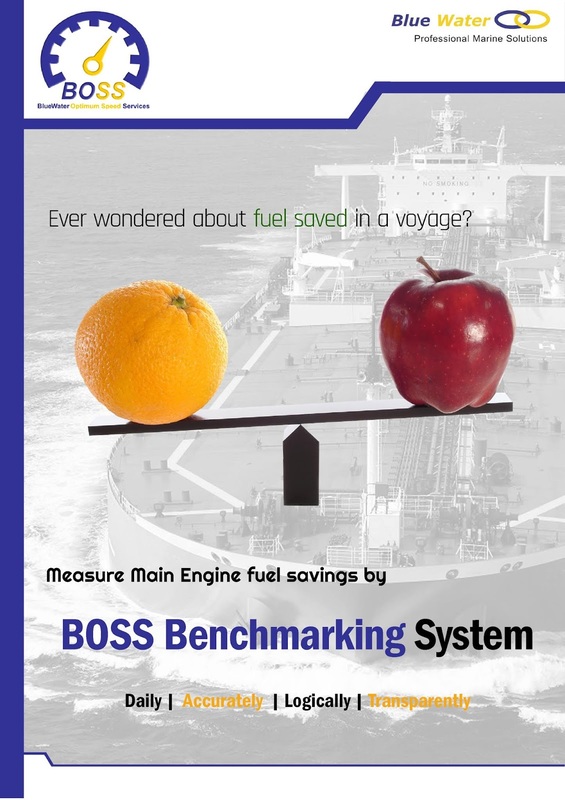 While weather routing agencies and energy efficiency consulting firms in maritime sectors may claim substantial fuel savings by utilizing their innovative services, there is always a question mark over the actual fuel saving achieved. Lack of transparent benchmarking system for comparing fuel consumption with and without engaging a fuel optimization service, is the primary reason for this apprehension. Developing a transparent and logical benchmarking system is a challenging task. Given the large number of variables including weather, Charter Party terms, berthing prospects and current vessel condition; it is impossible to find an identical voyage against which fuel savings can be compared. Blue Water has pioneered an exhaustive yet simple to understand benchmarking process for measuring fuel savings. The effectiveness of this system can only be quantified by reconstructing an identical voyage without the involvement of BOSS. 2. The arrival date/time at the destination is kept same as the Actual Time of Arrival of the concluded voyage.This ensures that the savings claimed are attributed to BOSS techniques and not to slow steaming by delaying the vessel. 3. The voyage is simulated on six hourly basis in the weather conditions that vessel would have encountered on the standard navigational route.Benchmark fuel consumption calculation does not use general average for weather on standard navigational route.To make the most accurate comparison, the simulation is performed six hourly to incorporate sudden changes in weather on the standard navigational route. This ensures that the same yardstick is used to measure the fuel consumption on the actual concluded voyage and the voyage reconstructed as per Master's passage plan. The Benchmark Verification Tool enables graphic visualization as well as tabulated comparison of the actual and reconstructed voyages. Both the voyage routes are superimposed on the weather and currents that prevailed during that passage. This process further enables comparison of M/E fuel consumption, Speed, RPM, Weather and currents on daily basis between the two voyages. The aggregated data of the actual and benchmark voyages allows the user to appreciate that BOSS route indeed encountered more favorable weather and currents resulting in a lower average engine RPM (hence lower fuel consumption) for achieving the same arrival time. Consider a Trans-pacific laden voyage of a Aframax vessel from Nikiski to Far East. 1. The average weather encountered on the actual concluded voyage is less adverse than that on the reconstructed voyage i.e 5 Bft, 309 Dir (rel) vs 6 Bft 328 Dir (rel). Similar comparison can be made for the currents. 2. 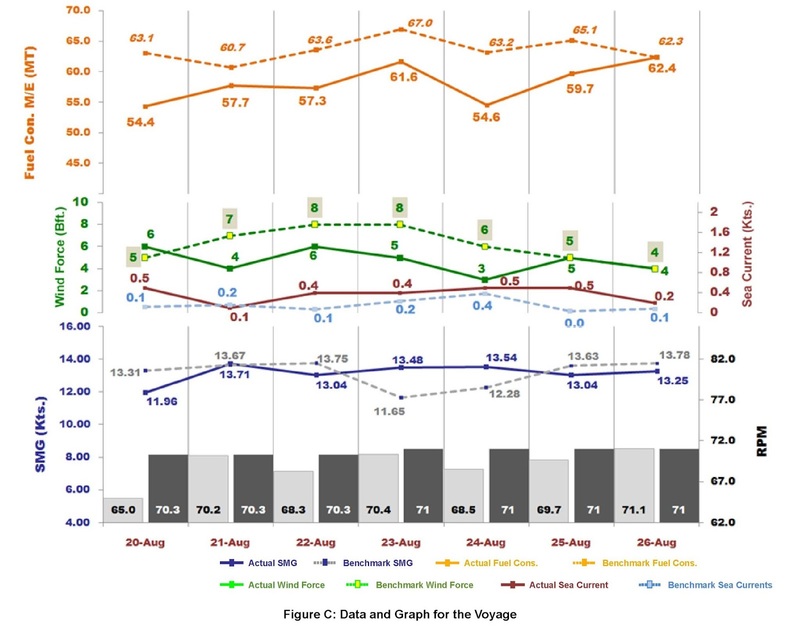 Owing to the above, the average RPM in the actual concluded voyage is 69.0 while that on the reconstructed voyage is 70.7 for achieving the same required ETA. This explains reduced fuel consumption by deploying BOSS on this voyage. 3. To verify the logic behind BOSS routing and speed scheduling, user may simply click on any date to comprehend BOSS recommendation for course and speed on any day. Eg. In the illustrations below, on 21st and 22nd August, BOSS maintained more northerly route to avoid severe weather associated with the storm in the vicinity. BOSS recommended route exploited tail winds to its advantage and helped achieve better speed at low fuel consumption while also minimizing bad weather exposure. The voyage results endorse BOSS claim of saving 69.3 MT (8.5%) of fuel oil on a 12 days passage of a laden Afra size vessel.The voyage reconstruction methodology as explained in this document, emulates the voyage without BOSS deployment, as accurately as possible. The methodology is not only accurate but also transparent and fully verifiable by the user, using the Benchmark Verification Tool.